SXnavo Infotainment System Delivers Media Richness to Buses, Trains, Stations and Shelters. SXnavo Infotainment delivers high -resolution real-time passenger information, route information, advertising and entertainment to riders and passengers waiting for transportation, or inside the vehicle. Vibrant digital LCD screens provide dynamic route status information such as arrival times, along with a range of different types of media content. Location-based advertising, news feed, alerts, the current time and weather, and more, can all be incorporated into the programming. Local and national advertisers use these attractive communication options, as do promoters and managers of attractions and events. Our Infotainment system can turn a potentially boring journey into an informative and entertaining experience. Infotainment is one element in our robust real-time passenger information system. The system delivers end-to-end information designed to enhance the customer's experience on many levels and can potentially increase customer retention and revenues. SXnavo rear-seat entertainment module has redefined what in-car or in-bus entertainment can be, transforming the passenger experience with integrated web browsing, theater-quality HD movies, and console-quality gaming. SXnavo Infotainment delivers the ultimate in passenger productivity and vehicle entertainment. HD video from car-mounted cameras increases driver glanceability about the surroundings. 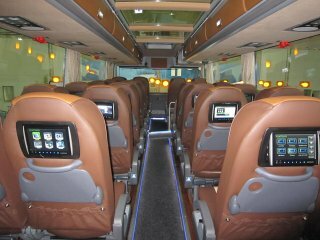 In addition, rear-seat passengers can enjoy hi definition movies for a theater-quality experience. In car WIFI connectivity for your connected car provides the ideal mobile workspace. It would be a great way to stay connected from wherever life takes you. Surf the web or get real-time weather, news, and other vital information—when and where you need it. ?